The premier site development contracting firm located in Atlanta, Georgia. We are the industry leader, providing unmatched onsite management, critical path movement scheduling procedures, accurate estimating with job phase costing that enables project completion on time and within budget. Our Mission has always been to render a team of people who will personify a quality and service-oriented attitude to serve and satisfy our customers while improving cost effectiveness with a business model that incorporates the logic to utilize the most efficient site development techniques that ultimately delivers an unsurpassed value to the customer, resulting in EDI providing top quality services. 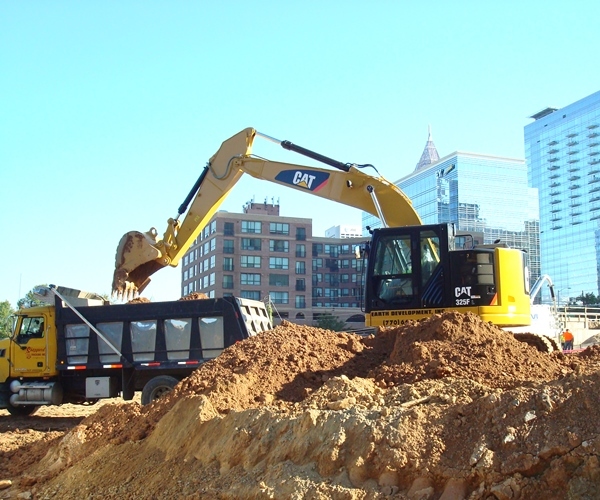 Earth Development, Inc. is a full- service site development contractor specializing in a wide range of grading services, traditionally developing sites ranging from five to sixty acres. Typically, these sites incorporate erosion control, clearing & grubbing, grading, sanitary sewer, storm sewer, water lines, fine grading, site walls, asphalt paving, curb & gutter. Multiple crews, first rate staff, and an extensive fleet of equipment serviced and maintained in house allows the company to meet the scheduling demands of any project. If your project requires the highest level of expertise and timely completion, EDI is the elite choice. Our accomplished team utilizes state of the art estimating, value engineering, and critical path management to deliver exceptional results and create the competitive advantage that Earth Development, Inc. is known for. We always provide the highest quality workmanship with exceptional customer service, ensuring that every customer receives a finished product that is sure to exceed their expectations. As a result, we are able to create strong, lasting relationships with our customers who proudly endorse our work. In Choosing EDI as your premier site development contractor, you never have to settle for anything but the best! Be sure to check out our extensive list of repeat clients and the notable projects we have completed. This is something we take great pride in, as it attests to our superior results. Call Earth Development, Inc. for your next project!